Puncture Film to remove entrapped air bubbles. Air release tool 391x and 392x replacement points. Gold Nylon, Blue Plastic, White DI-NOC and CPA-1 Power Grip squeegees for vinyl or premask application. Designed for use with 3M films for Textured Surfaces, these applicator tools allow you to apply to brick, concrete, stucco and other rought surfaces to give vinyl a painted-on look. 3M Trim Masking Tape is designed to lift and protect trim moldings during masking, eliminating overspray and visible paint edges. This ultra-soft, non-scratching, lint-free microfibre cleaning cloth quickly and completely removes oily or film residues including waxes, polishes, glazes and fingerprints. ASLAN C-pen is a white liquid chalk pen for writing on all types of blackboards and blackboard films. Vinyl application squeegees are applicable for every type of installation: White Hard Card Plastic, Blue Felt Edge, Red Pro Flex Felt Edge, FleXtreme Mico Squeegees and Pro Rigid. The Supreme Wrap Care range includes a Cleaner, Power Cleaner and Sealant. These are professional grade products that are simple for anyone to use. They help matte, satin and gloss vehicle wraps cope with the challenges of the road after leaving the workshop. Avery's specially designed, completely seamless, grey cotton glove is for easy and precise application of self adhesive wrap material. This wrap glove has built in anti-static properties and provides good friction resistance during application. A 50#, inexpensive, one-time use backer for single sided lamination on roller laminators. Drytac Magnetic Tape A & B are two different magnetic tapes of opposite polarity, each coated with a permanent pressure-sensitive adhesive on one side. World-renowned BannerBug retractable banner stands are made in Australia and offer a lifetime limited guarantee! Single or double-sided banner stands come in a variety of sizes from 8 11/16" to 114" widths. The Dust Removal System (DRS) Roller removes dust and dirt from prints, substrates or film without leaving a tacky residue. The blade on this safety knife is fully enclosed by a moulded plastic handle to protect fingers and silicone rollers. On-A-Roll Media Lifter (Universal) allows single users to maneuver heavy print and laminate media rolls onto the lifter and then directly onto the printer feeder. Adjustable roll wedges and a removable roll ramp permit use with most printers and flatbed roll-to-roll cutters. A 20" metal roller tray designed to allow the rolling out of any width material up to one hundred fifty (150) lbs. The two metal rollers are placed 2" apart so the user can unroll or re-roll flexible material without any effort. Hand-lettering brushes that are brass wire bound, brown Kazan quill attached to blue handles. Very soft brushes for lettering on glass and other smooth surfaces. Available in graduated sizes. Olfa A1160B are universal carbon steel 30 degree snap blades. Each box contains 10 blades. Standard duty acute angle snap-off blade for use when precision is a must. Seven cutting edges per blade strip. Olfa AK-4 cushion handle, high performance knife and KB4-S replacement blades. Olfa series 180, 9mm size knives and replacement blades are ideal for lightweight cutting of paper and film. Stainless construction with the exception of the handle which is yellow plastic. Multi-purpose knife, ideal for cutting paper, film and plastic. LB-10B, 18mm replacement blades fit the L2 heavy-duty utility cutter with rubber grip. Long lasting, durable snap-off blade - a new sharp edge with each snap. 10 blades per pack. SVR-2 is an ideal 9mm utility knife. The auto-lock mechanism allows for quick changes to the cutting depth with just one hand. Full stainless steel body is perfect for use in moist environments where rust is a concern. Bubble Popper air replease pen for use with all vinyl films. Ideal for thinning polyester resin, cleaning fiberglass tools, and dissolving two-part epoxies & adhesives before hardening. Useful as heavy-duty degreaser. A multi-use cleaning agent for cleaning printheads or as final wipe prior to digital-printing on rigid substrates. Available in 70% or 99%. Screen wash for lacquer-based screen inks. Big Blue Safety Ruler is the one choice for the finishing room. Made of heavy duty aluminum construction with a curved finger guard for maximum protection from knife mis-use or slips. Protect your work table surface with these white, semi-translucent, high impact polymer blended cutting mats. Can be combined with optional measuring grids which are placed underneath. Sooper Ace Hand Press Grommet machine is made of cast iron, and is still portable. This hand-operated unit cuts a hole and sets a grommet simultaneously. #2 Die (3/8") is included. These 100% polyester, white, lint free wipes are 9"x9" with sealed edges. For use in clean rooms, electronics and medical environments. 150 wipes per pack. Foamwerks cut perfect straight edges on any depth of foamboard from 1/8" to 1/2"(3.1mm to 12.7mm). A practical, hand-held cutting tool that allows you to cut media across the length of a cutting table, without leaning over the table. Roll vinyl over rivets and contoured surfaces, such as door handles and side moldings in seconds with RollePro. Self Healing Cutting Mat 3/16"
A clear, flexible, self-healing cutting mat that is 3/16" thick and made of clear PVC. It will not curl or lift once rolled out. Ideal for use on flatbed application tables that are illuminated or placed over top of measuring grids on your work table. Mobile storage rack for up to 16 rolls of media and banner material. Heavy Duty aluminum 10-roll wall rack for storing rolls of print media, colour change media, banner rolls, laminates and much more. Scraperite yellow razor blade holders work with either orange plastic or blue polycarbonate plastic razor blades. This tool helps to lift and peel away pressure sensitive vinyl, dirt, grime, wax, tar, gum and any other substances, while not damaging surface areas. This knife will cut through only the paper backing of a self-adhesive vinyl. No more risk of damaging your film or adhesive or cutting through the film side of your vinyl while on its backing paper. Disposable tool that seperates the liner from the adhesive film in order to cut the liner. The Purple Sooper Edge Ruler is the premier safety ruler in the sign and graphic industry. Made of heavy duty aluminum construction with an inserted stainless steel edge to eliminate cutting into the ruler. It also has a curved finger guard for maximum protection from knife mis-use or slips. Sooper clips easily secure your wound media rolls for storage. The simple to use clips have a finger hole for quick slide on and off. 50-pack has 25 each of large and small clips. Sooper Edge T-Square attachment is made of heavy duty aluminum. This attachment makes perfect 90 degree angle. Designed to fit all Sooper Edge and The Big Blue Safety Rulers from 18"to 96". Spike is the world's first laser smartphone measurement estimation solution. The Spike device, Spike mobile app, and your Smartphone work together to change the way measurements are taken and shared. Opens dried-up areas on screen-prints and signs. Leaves no film. For use on screens made with photogenic, stencil films. Pressure-sensitive, repositionable formula will not transfer to fabric. Ideal for t-shirt screen-printing. 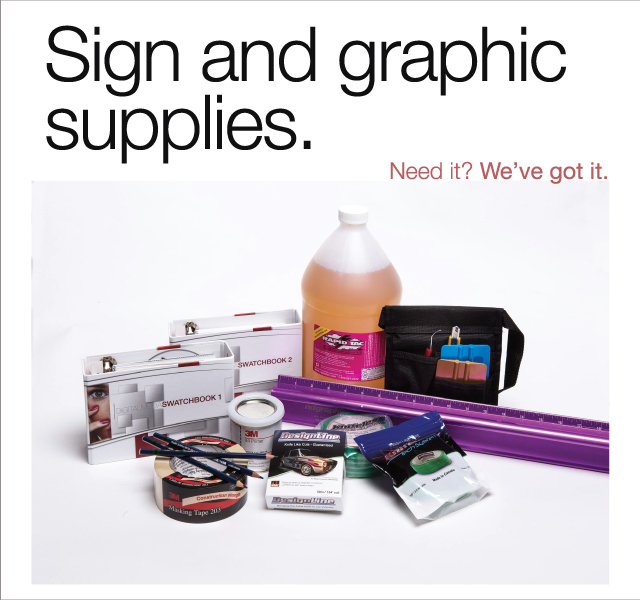 Bonds to cloth, paper, cardboard, foil, plastic, foam, rubber, leather.